Alexander Minin, Alexander Shemiatkin and Ivan Shynkarenko were recommended by the Best Lawyers in Ukraine 2019. Alexander Shemiatkin has won the special honorary title “Lawyer of the Year”. KM Partners has been recognized as the Ukrainian Law Firm of the Year in Tax Law. Tier 1 in category of Tax. Tier 3 in category of Employment, Real Estate and Construction. 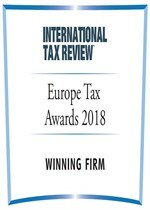 According to the Chambers Europe 2018 KM Partners is a leader in “Tax” category and recognized practitioner in “Dispute resolution”.